Live to Love provides cutting-edge education deeply rooted in Himalayan culture which inspires the next generation to act as guardians of their culture, their home and their environment. Our goal is to provide children with an appreciation of their culture while providing them with the skill set to further the economies of the region. Our school puts particular emphasis on educating young girls and empowering them with the confidence and competence to take leadership roles. Live to Love brings technology coupled with ancient philosophies to tackle modern environmental issues and address educational needs. We work with educators, engineers, civic leaders, families, students and architects from around the world to best serve the Himalayas. While integrating some of the most advance ecological technology, the design team integrated local building techniques respecting the design of the region as well as respecting the natural landscape. Located in Nangchen, formerly one of the give independent kingdoms of Eastern Tibet, the Chakchen Ling School is nestled in a renowned cultural site and act as a beacon of hope and recovery. In 2010, this region suffered a 7.1 magnitude earthquake injuring over 12,000 people and killing nearly 300 others. The quake demolished 11 crucial schools across the region, leaving thousands without access to education. The Chakchen Ling School is a sustainable, ecological and compassionate solution for an entire generation alienated by this catastrophic disaster. 300 students are currently enrolled in its existing structure, with thousands of prospective students on the waiting list. The long-term vision is to accommodate 10,000 students in the next ten years, making it one of the largest educational institutions in the Chinese Himalayas – and the greenest instituation available. To support Chakchen Ling School, click here. Located in Ladakh in the state of Jammu & Kashmir, is an example of sustainable design. The school serves as an international model of green education and a model of a Montessori curriculum. The school’s mission is to provide an effective modern education while maintaining the traditional values and culture –an unprecedented project for the Ladakh region. The Druk White Lotus School is deeply rooted in traditional values while utilizing modern technology to help revive an economically depressed region and to empower young women. In seeking to advance those values and preserve culture in the context of the twenty-first century, the Druk Padma Karpo School seeks to provide children of the next generation with appreciation of their culture while providing them with the skill set to further the economies of their region and the skill set to solve today’s modern problems. Hemis is the most-visited monastic site in Ladakh, India. Hemis has, over the centuries, become regarded as a unique “living museum” of Himalayan culture visited by tens of thousands of locals and foreigners each year. Preservation efforts at Hemis are currently underway –along with an extensive educational complex for adult students. The new education building will incorporate the principles of sustainable development, utilizing local aesthetics and materials in a modern design. Based on the maximization of sun light at certain times of day, the building will be nestled into a hillside to both insulate and cool in relation to the extreme weather conditions of the area. Because it is in a relative remote area of India, the project is geared towards providing practical education to those who did not have the opportunity to be educated or have access to education at a younger age. The design of Druk Padma Karpo School integrates both modern technology and ancient local building techniques. The Druk White Lotus School was constructed not only as a model for appropriate and sustainable design but it was also built to serve as a learning tool for the students. This school was conceived as an entirely sustainable project. The ecological context is fragile, and consequently the site strategy aims to ensure a completely self-regulating system of water, energy and waste management. To support Druk Padma Karpo School, click here. Inspired by Nobel Peace Prize winner, Wangari Maathai, Live to Love launched an initiative to plant one millions trees in Ladakh. As part of this initiative, Live to Love volunteers broke the Guinness World Record twice for most trees planted simultaneously. To support One Million Trees, click here. Live to Love works closely with the Waterkeeper Alliance to launch the Himalayan Glacier Waterkeeper program. The Himalayan Glaciers feeds the most important rivers in Asia and provides water for over 1.5 billion people in the region. The threat is increasing with climate change, introduction of plastic into water sources and as the political situation wavers, water disputes are raising. Live to Love works to educate Himalayan on water preservation in particular the Indus and Zanskar Rivers. To support Clean Water Monitoring, click here. Live to Love provides people-centric health services. We believe that the best preventative care is to ensure the well being of the community at large. With the help of the World Health Organization, hospitals and health professionals around the world, Live to Love has several health clinic where locals, especially women, are trained to execute services in basic health and help initiate community outreach. This has proved to be especially effective. The Druk White Lotus Clinic is located in Swayambhu, Kathmandu and serves the community at large and houses many of Live to Love’s medical initiatives. The clinic provides services in allopathic medicine, burn treatment, dental care, ophthalmology, traditional medicine and houses a pharmacy. It is also the location for many training programs and houses families of patients during times of care. To support our Druk White Lotus Clinic, click here. In regions where medical care is not readily available, Live to Love provides temporary “camps” of doctors to provide basic needs to the local population. Medical services include eye surgery, dental care, dermatology and general care. To support our Medical Camps, click here. 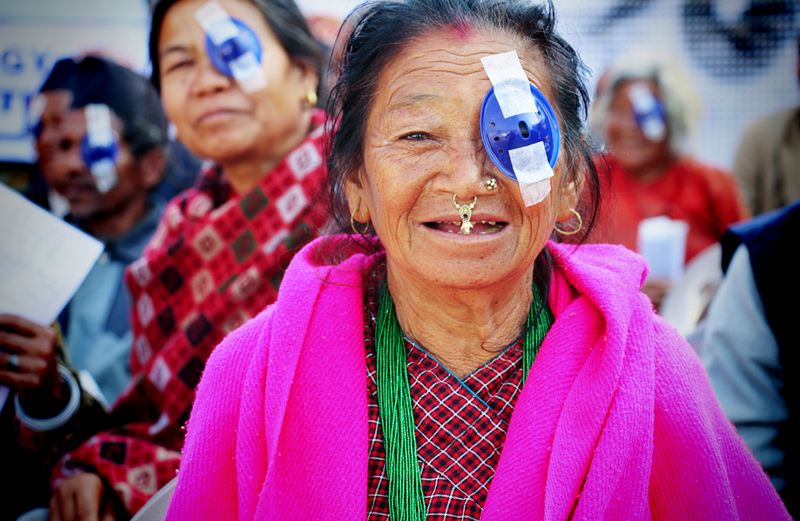 Since 2009, Live to Love has restored sight to over 1,500 Himalayans. The Himalayan people suffer from a high incident of cataracts – which frequently lead to complete blindness. Live to Love performs free eye surgery restoring eyesight to hundreds who medically qualify. We also provide post-operative care to patients, and we house their family members during surgery and recovery. To support our Eye Camps, click here. Live to Love works with dentists around the world to provide much needed dental care and education to the Himalayan population. To support our Dental Camps, click here. Live to Love integrates traditional Amchi medical practice with modern medicine to provide integrated services to its Himalayan clientele. Amchi medical practice is a tradition indigenous to the Himalayas and Central Asia. It plays a crucial role in the emphasis of hygiene, clean water, good diet and healthy lifestyle practices. In particular, in regions such as Ladakh, the Amchi is a well-respected position in society that advocates for the well-being of the community. To support our Traditional Medicine, click here. Live to Love supports Live to Rescue a joint project with the Young Drukpa Association and the Animal Husbandry Department of Leh. Live to Rescue provides humane treatment of homeless dogs in Ladakh with sterilization and a possibility to find a home. Live to Rescue is Ladakh’s most effective animal protection organization working towards reducing the suffering of animals and fostering a harmonious relationships between animals and people of the region in the face of rapid development and tourism. To support Live to Rescue, click here. Historic Ladakh and the Drukpa community makes its home along the Silk Route in the Himalayan mountains, once the world’s most important trading route. Drukpa’s believe in accepting all pathways to truth and enlightenment and was an example of interfaith co-existence. Once an empire spanning the China-India-Pakistan border, Ladakh is still an area where Muslims, Hindus and Buddhists live in integrated communities and maintain their traditions. Celebrating the diversity of this region has become critical in building sustainable peace in this region. Heritage preservation fosters cultural diversity and international dialogue which contributes to the culture of peace. In preserving heritage, we bring people from around the world to experience the authenticity of a distant culture but also to remind us that our hopes, dreams, frustrations and challenges transcend time, space and borders. Live to Love focuses on art and culture located along the silk route which face threats from climate change and political instability. Live to Love works to restore and preserve ancient artifacts, relics and edifices in this region. Solution: One such example is the Hemis Museum. Hemis houses one of the most important collections of Buddhist art and Ladakhi history. To support Cultural Preservation, click here.